Originally a partner with T. M. Pepper in the Norton Bottling Company, Thomas B. Hillman sold his share of that business in 1905 to start his own bottling company in Coeburn, VA. The company appears on the 1908 and 1913 Sanborn maps as being located near the railroad tracks behind the old Coeburn Grocery building. 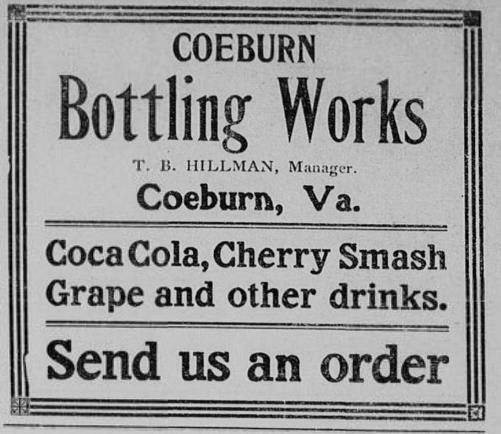 According to an advertisement in the Clinch Valley News of July 14, 1911, they are bottling Coca-Cola, Cherry Smash, Grape, and other drinks. (1) The 1910 federal census lists T. B. Hillman as a manufacturer of Soft Drinks living in Lipps, VA. They appear to also be distributing by rail, as the Clinch Valley News is a Tazewell, VA newspaper.